Professor Ricardo Lopez dictated a new Regional Seminar this past May 22th. and 23th.. The seminar took place in San Carlos de Bariloche, Argentina, in one of our branches: Aiki Dojo Bariloche. A distinct number of participants, both from our school and from other organizations, attended the 2 day seminar. Like on previous visits, Professor Ricardo Lopez conducted Kyus evaluations. It is worth highlighting the hard work, commitment and dedication of the evaluated practitioners. Let us remember that the Aiki Dojo Bariloche is led by Prof. Mario Rios, 3er. 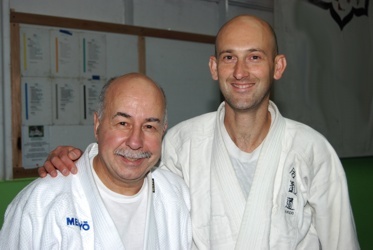 Dan Hombu Dojo, Japan, featuring Prof. Ricardo Lopez as the Dojo technical director.